This recipe is a hybrid between my mothers famous “opening party loaf” and JackassbrÃ¶det. The problem with my mothers bread is that it’s too good, and perhaps not super healthy since it’s almost 2 dl syrup in it and only white flour. Her bread is only for special occasions and since I’ve started baking on a regular basis, I can’t just eat that all the time, it would be like eating candy every day (which I of course do, but you understand what I mean). The recipe is divided into two parts. Day one and day two. â€¢ your favourite spices/fillings. The bread shown above has crushed Fennel and Flax seeds in it. Yum! Another option is chop a lot of walnuts! Put 50 g fresh yeast in a bowl together with 1 dl syrup, 1 dl wheat flour, 5 dl water (37Â° C) and a teaspoon salt. Cover the bowl with a towel and let it bubble. Then pour 6 dl boiling water over all rye flour in another bowl. Stir it some and let the bowl rest covered. Pour the rye “dough” into the bubbly yeast-bowl. If it smells really bad, your on the right track! Use your fingers to “melt” the rye dough and then add wheat flour. Stir and add and stir and add and keep doing that until the dough is leaving the surface of the bowl. Then kneed for as long as you like. To quote my brother who quoted some fancy bread book: “it thrives on abuse”. When your arms are too tired, then let your friend kneed more! Let it rise for a while covered by a towel. Divide the dough into two loafs and put them on a baking tin and let them rise for some more time if you like, while your oven gets warm. It should be on 175Â°C. Before you put the bread in the oven, sprinkle some (halv a dl) water on the bottom of the oven. Bake it for a long time. You know it’s done when the bread turns brown, almost burned. When done, do not cover the bread. Let the baby instead inhale the new world outside the oven! Eat with butter and a lot of jam/cheese/whatever! Ooh you’ve started baking! This looks yummy. 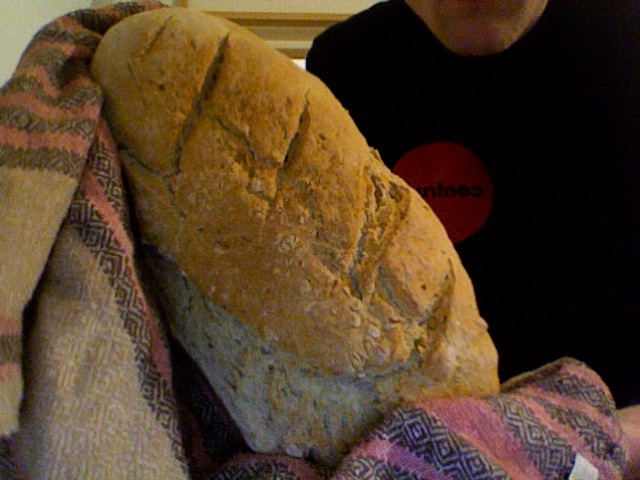 I have only started doing my own bred recently and i try to avoid white flour as much as possible. Thank you for this useful information. In this website I hope to find more useful information. Thanks for this useful receipe.